Having conducted around 70 orchestras in Europe, the US, Japan and Brazil by age 36, de la Parra is an internationally known performer. Mexican conductor Alondra de la Parra has gained widespread attention for her international performances and her commitment to promote Latin American composers. She frequently works with some of the world's most prestigious orchestras including Orchestre de Paris, London Philharmonic Orchestra, Berlin Radio Symphony Orchestra, Orchestra dell’ Accademia Nazionale di Santa Cecilia and the Tonhalle Orchester Zurich. In 2017 she started her term as general music director of the Queensland Symphony Orchestra, becoming the first ever music director of an Australian orchestra. In the 2016/17 season, she made her debut with Bamberger Symphoniker, Kammerphilharmonie Bremen and the Orchestre de la Suisse Romande. Further highlights were her debut at Beethovenfest Bonn and concerts with the BBC Philharmonic. In Latin America, de la Parra works frequently with a diverse array of Mexican ensembles as well as the Orquestra Sinfônica do Estado de São Paulo, the Orquestra Sinfonica Brasileira and the Orquesta Filarmónica de Buenos Aires. 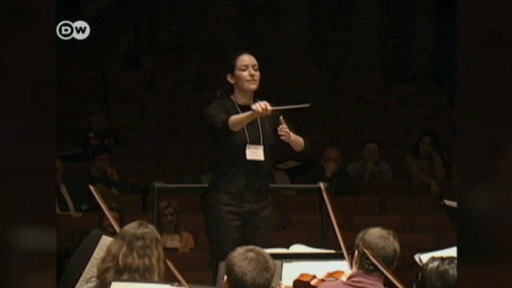 She has received awards and acclaim for her work with the Simón Bolivar Youth Orchestra of Venezuela. Alondra de la Parra was born in New York City and moved to Mexico with her parents at age two. She began playing the piano at age seven and the cello at 13. After studying in Mexico City and New York, she founded the Philharmonic Orchestra of the Americas in 2004, hoping to create a platform to showcase young performers and composers of the Americas and securing a firm place in the standard orchestral repertoire for the continent's music. Since 2003, Alondra has developed several education programs in public schools of New York and in Mexico. She has done multidisciplinary collaborations with artists such as actors Geoffrey Rush and Robert Redford and musician Gloria Estefan. Alondra de la Parra is an official cultural ambassador of Mexico.